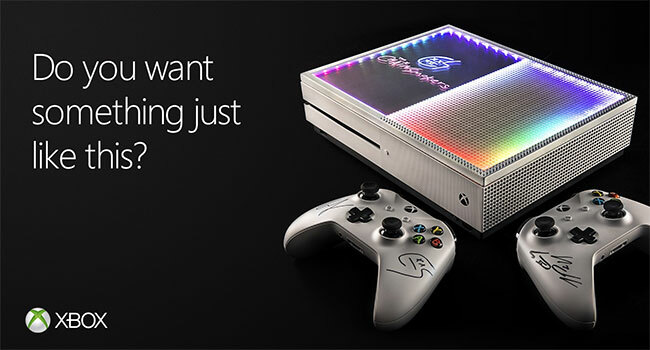 Xbox is excited to announce the creation of custom, one-of-a-kind Xbox One S consoles that will pair fan-favorite celebrities and brands with their favorite gaming console, for a truly unique Xbox experience. The first of these unprecedented custom consoles is designed with the hottest DJ duo in the world, The Chainsmokers, bringing light and sound together, creating a stimulating experience as if you were at one of their high energy, sold-out shows. To create the console the Xbox team used a thumbnail-sized, USB-powered microprocessor that works in real time to convert sound into an ever changing and dynamic light show. Sixty miniature pixels illuminate the multi-layered acrylic display creating a 3D effect, lighting up this Xbox One S.
“Over my time, I have seen many unique consoles come to life but nothing ever like this one. This is a true piece of art and we’re so excited that we got to partner with The Chainsmokers on it,” says Aaron Greenberg, GM of Games Marketing at Xbox. One very fortunate fan will have the chance to win the console by participating in the giveaway opportunity on The Chainsmokers Twitter account from today (Fri, Sept 8th) through September 17th. Even if they don’t win the console, everyone can listen their hits such as “Closer” or “Paris” via Groove or Spotify on their own Xbox One S to enhance their gaming and listening experience. Be on the lookout for other buzz-worthy Xbox custom consoles throughout the rest of the year, all of which will combine design with top personalities from music, sports, television, fashion, art and Hollywood.